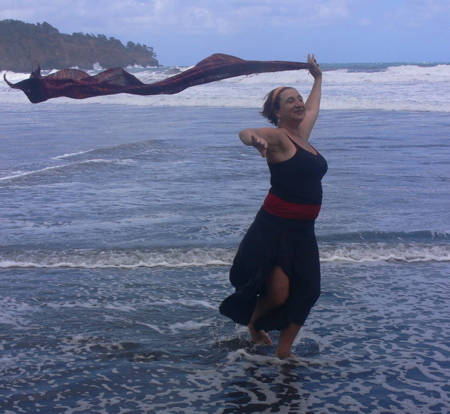 Celeste Snowber, Ph.D. is a dancer, writer and educator as well as an Associate Professor in the Faculty of Education at Simon Fraser University near Vancouver, B.C., Canada. She has focused her work in the area of embodiment and arts education and has widely published her essays and poetry in various journals and books. She is the 2016 recipient of the Ted Aoki Award for Distinguished Service in Curriculum Studies. Her personal website can be found at www.celestesnowber.com. She is author of Embodied Prayer, which is currently in its second edition and is the co-author of Landscapes in Aesthetic Education.Her performance works are centered on improvisation and integrate narrative, voice and the practice of Interplay. She also fuses dance and poetry as she creates site-specific performances in the natural world. Celeste is presently the Artist in Residence in the UBC Botanical Garden creating performances of dance and poetry. Celeste’s recent book of poetry is Wild Tourist published by Silver Bow publishing. Celeste lives outside Vancouver and has three sons, all a beautiful tribe of artists.